If WordPress is your publishing platform and you want the pages of your site to load faster then you should think about caching. WordPress caching is done in a very simple way as it makes a copy of your web pages and save them in your server as HTML documents and/or cached database queries. After that when someone comes to a web page of your site, the server provides them with the cached page instead of re-querying your database and dynamically creating it, and this process speeds up the page response time and reduces the server resources needed for creating and serving a web page. 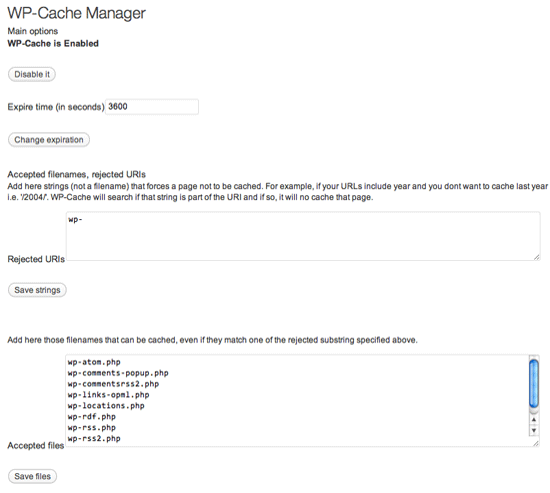 Well if you are a WordPress user then you can get a good plugin to do this caching job for you easily. Many different WordPress cache plugins are present out there but some really good ones are listed below. Check them out! DB Cache Reloaded Fix is a version of DB Cache Reloaded and is compatible with WordPress 3.1. It gets the MySQL queries executed on your database to optimize the speed of the website. 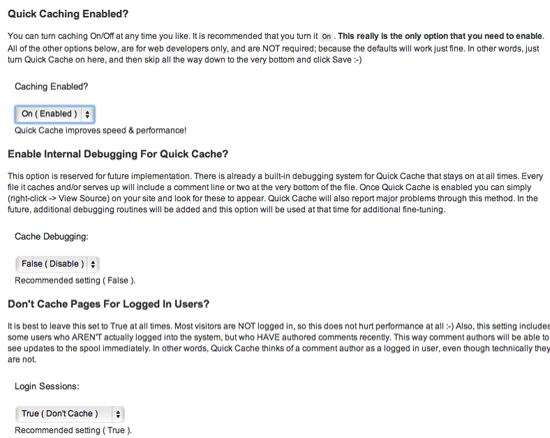 Whilst database query caching would do for most websites, and this plugin does its work really nicely. It is a new WordPress caching plugins, so it is not yet field-tested by WordPress users as much as the older plugins have been. As the name suggests it is a version of the famous Hyper Cache WordPress plugin. It has many features like 404-error-page caching, support for mobile devices, and various compression options. This plugin loads quite quickly on phone working on Opera Mini and an iPhone. This is a great plugin that is loved by users and its ratings at WordPress.org is a proof of it. And the best part is that its developer Mapto Lazarov even asks users to give him feedback and tell him of any issues with this plugin! 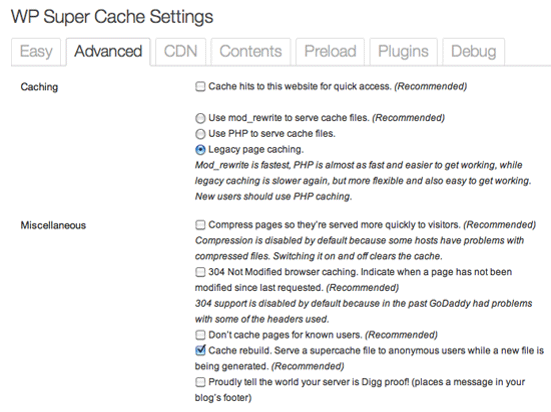 Quick Cache is a WordPress caching plugin designed by Prime Themes. It’s lightweight and has user-friendliness as one of its selling points. The admin interface itself outlines each option in fine detail so that you know exactly what each option does. 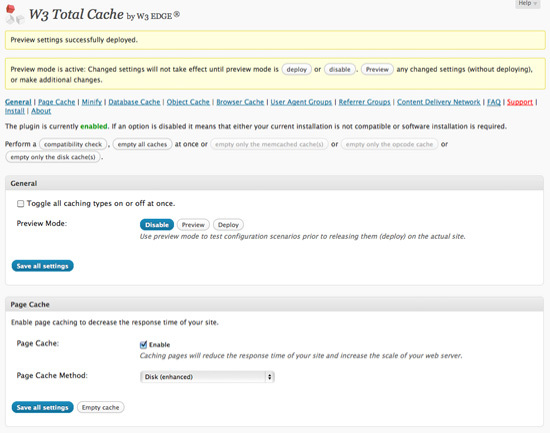 This one is one of the most famous caching plugin out there. It is used by many famous sites like Mashable and Smashing Magazine. It claims that when you use this plugin your site will load 10 times quicker. W3 Total Cache provides you with a lot of options and features like source code minification and integration with your content delivery network (CDN). If you are a beginner and do not understand the admin interface then you can always leave the plugin at default settings which are pretty good. It is one of the oldest WordPress caching plugins as it was launched on WordPress.org in 2007. It lets you specify which posts, pages and files should not be cached. This plugin works quite well but its update frequency is a bit lower. This plugin does a different kind of WordPress caching. It does not caches the whole page but only some specific parts of it. So this means that the performance will not be effected and time of loading a page will not be reduced but it is quite suited for high-traffic sites that often update web pages and WordPress users that would like to allow the caching of some specific portions of a web page. It creates a static HTML files of the content of a WordPress website. It gives you the ability to determine the timeout settings for cached pages and the frequency of auto-cleaning the cache files. But as the name suggests it is a simple plugin with not many options to tweak. The home page of this plugin is in Turkish, so, if you do not know Turkish, you won’t find much information there. This plugin displays static HTML pages to many visitors to your site. The creator of the plugin claim that if your site is high-traffic but you have an underpowered web server, then plugin works will work like magic. It also has the ability to cache certain WordPress plugins, and this thing helps a lot in ameliorating site performance. Yeah! got it. But the question is that I am using Hyper cache, recently read most about W3 Total Cache, What is the beast between them? Thanks for the comprehensive information. Sounds like Hyper Cache extended is a good one. I am currently using WP Super Cache. No complaints. Enormously useful thanks, I believe your audience might possibly want even more content similar to this keep up the great effort.